Market-cap-weighting reflects all market participants’ views, allowing passive investors to free-ride on the collective wisdom of all active investors. But there is a risk that it could also lead a portfolio to overweight the most expensive areas of the market. Fundamental index funds attempt to circumvent this potential problem by severing the link between a stock’s portfolio weight and its price. This article explores the investment thesis of fundamental weighting and examines the investment merits of strategies that use this weighting approach. Market-cap-weighted indexes are inherently efficient and inexpensive to implement. A stock’s weight in a market-cap-weighted index moves with its share price. Investors save on transaction costs because the index’s largest positions are naturally the biggest companies with the most-liquid shares. Unlike market-cap-weighted indexes, fundamental indexes size their holdings by metrics such as company revenues, earnings, or dividends instead of share prices. “Fundamental” here is a bit of a misnomer because these metrics are only fundamental in that they’re usually metrics that traditional fundamental stock-pickers use to evaluate companies. But because fundamental indexes use the absolute level (such as total revenues) rather than a price-relative ratio (such as price/sales) to size positions, they maintain a similar large-cap orientation to market-cap-weighted indexes while breaking the link to share price. The largest companies generally have the most revenues/earnings/dividends and receive the largest weights in the index. Fundamental indexing is an intuitive weighting approach, but what does it really bring to the table? The primary argument against fundamental indexing is that it is simply a value strategy repackaged as something new. Most of the time when a portfolio deviates from market-cap-weighting, the alternatively weighted portfolio increases the weights of smaller-cap stocks and decreases the weights of larger-cap stocks. The value tilt inherent to fundamental indexing stems from two sources. First, by weighting its holdings by a fundamental metric (such as revenues), the strategy overweights stocks trading at a lower multiple of that metric. Second, when the strategy rebalances, it trims stocks that have increased in price relative to that metric and adds to those names that lagged the market relative to the fundamental metric. While this weighting approach favors value stocks, it has less consistent exposure to value than market-cap-weighted value index alternatives because it does not explicitly target value stocks. In a paper titled “Why Fundamental Indexation Might–or Might Not–Work,” Morningstar’s Paul Kaplan highlights that fundamental indexing implicitly assumes that all companies should trade at the same valuation multiples. Efficient market supporters counter that stocks should, and empirically do, trade at different multiples based on their risk and growth profiles. Kaplan also asserts that without knowing a stock’s fair value or fair valuation multiple beforehand, it is impossible to conclude in advance that a stock’s current market price is too high or low or whether a stock that commands a high valuation is overpriced. Several suites of fundamentally weighted exchange-traded funds have a decade of live performance data. WisdomTree offers both dividend- and earnings-weighted ETF suites for the large-, mid-, and small-cap market segments. Oppenheimer provides ETFs that weight their holdings by revenues. And Invesco (and more recently Schwab) offers fundamentally weighted ETFs that leverage Research Affiliates’ RAFI indexes. 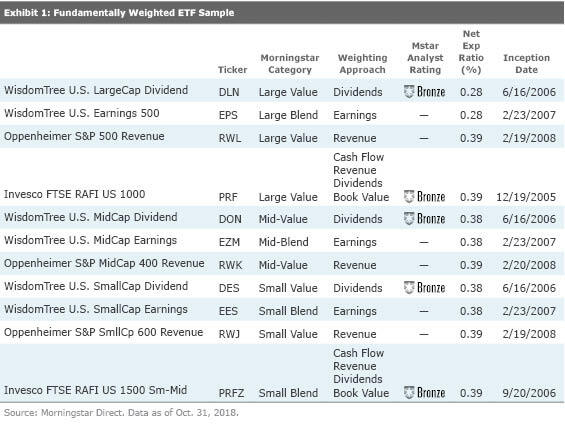 The RAFI indexes combine several fundamental metrics such as cash flows, revenues, and dividends rather than a single metric to weight its holdings. Exhibit 1 provides a summary of the fundamentally weighted ETFs that I’ll examine more closely. I used Portfolio Visualizer, a free web-based tool, to test the idea that fundamental indexing benefits from small-size and value tilts by regressing the funds’ monthly returns against monthly small-size, value, momentum, and profitability factor returns per the French Data Library. This analysis used monthly return data from April 2008 (the earliest common inception date) through September 2018. Exhibit 2 displays the regression coefficients (or factor loadings) of each fund’s returns against selected factor returns. Nearly all of the fundamentally weighted ETFs have value factor loadings that are statistically significant, or most likely not attributable to chance. This indicates that a portion of the fundamentally weighted ETFs can be attributed to exposure to the value factor. The exceptions are WisdomTree U.S. Earnings 500 (EPS), WisdomTree U.S. MidCap Earnings (EZM), and Oppenheimer S&P MidCap 400 Revenue (RWK). And all of the fundamentally weighted ETFs, except WisdomTree U.S. LargeCap Dividend (DLN), have statistically significant negative momentum loadings. This is likely due to their contrarian rebalance. Because these strategies are segmented by market capitalization, the small-size factor exposure is not surprising. 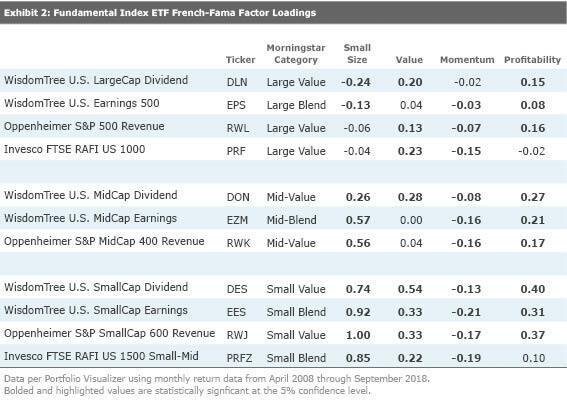 The large-cap fundamentally weighted ETFs show negative exposure to the small-size exposure, although only DLN and EPS’ size exposures are statistically significant. All mid- and small-cap fundamentally weighted strategies show statistically significant positive size factor loadings. Value and small-size loadings contribute to investment return of this sample of fundamentally weighted strategies. Research Affiliates, pioneers in fundamental indexing, agree with the assertion that fundamental indexing strategies largely benefit from value and small-size factor tilts. Rob Arnott, CEO of Research Affiliates, and colleagues found that many non-market-cap-weighted strategies, including fundamental weighting, outperformed the market-cap-weighted benchmark. In a paper titled “The Surprising Alpha From Malkiel’s Monkey and Upside-Down Strategies,” they show the performance results when they flip the weights of the fundamentally weighted portfolios around so that the smallest holdings receive the largest weights. These inverted portfolios also outperformed the market-cap benchmark and, in many cases, the original strategies. The authors argue that the success of both the original strategies and their inverses is attributable to their implicit tilts toward small-cap and value stocks. Research Affiliates has also argued that fundamental index strategies benefit from their inconsistent value loading. The strategy adds to stocks as they become cheaper to a fundamental metric, rather than bifurcating the market based on value and growth stocks. Research Affiliates goes on to assert that fundamental index strategies increase value loading as value becomes cheaper and decreases it as value becomes more expensive. Thus, fundamental indexing offers a dynamic value tilt which can benefit investors. The dynamic value orientation could be worth the higher fee that these funds levy compared with market-cap-weighted value funds. But timing the value factor is notoriously difficult, and the dynamic approach still does not offer a unique exposure. That is part of the reason why the fundamental index funds in this article that Morningstar rates earn Analyst Ratings of Bronze, one peg lower than the cheapest and best-run market-cap-weighted value funds. These cap-weighted ETFs include Schwab U.S. Large-Cap Value (SCHV), iShares Core S&P U.S. Value (IUSV), Vanguard Mid-Cap Value (VOE), and Vanguard Small-Cap Value (VBR). These all offer more-consistent value exposure at a fraction of the price of the fundamentally weighted options. or makes any representations regarding the advisability of investing in any investable product that tracks a Morningstar index. Adam McCullough, CFA has a position in the following securities mentioned above: VBR VOE. Find out about Morningstar’s editorial policies.